SKOHRboard: Mike Tyson Wasn't in the Boxing Hall of Fame? Somehow Mike Tyson was not in the Boxing Hall of Fame until yesterday. I don't know what the protocol is for getting into the Boxing Hall of Fame but it seems crazy to me that Tyson wasn't in there until yesterday. As far as I'm concerned he should have been in there 20 years ago when he was the most feared boxer who ever stepped in the ring. Check out the "fights" in the video below to see about 4 minutes of Iron Mike destroying opponents hopes and dreams... and faces. Yeah he should have been admitted into the Boxing Hall of Fame about 2 minutes into that video. What a dominant pugilist. Other guys that I can think of over the last 20 years include Foreman, Holyfield, and Lewis. However, none of those guys was as devastating as Tyson was in his prime. Maybe there is some sort of waiting period before a boxer is eligible to be admitted but this seems like an awfully long time to wait for Mike Tyson. Oh and Rocky was also admitted into the Boxing Hall of Fame this past weekend too. Actually Sylvester Stallone was admitted as a filmmaker, not as the character. 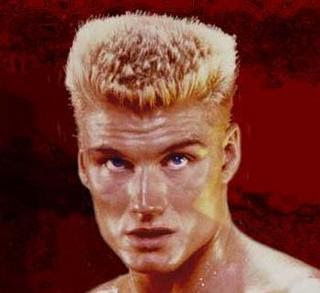 HOWEVER THE OUTRAGE IN ALL OF THIS IS THE SNUBBING OF IVAN DRAGO!! !